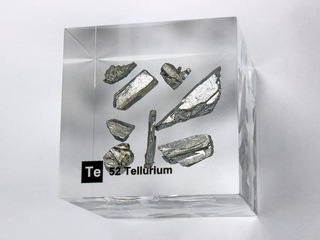 Tellurium was discovered in 1783 by Baron Franz Josef Müller von Reichenstein in Sibiu, Roumania. 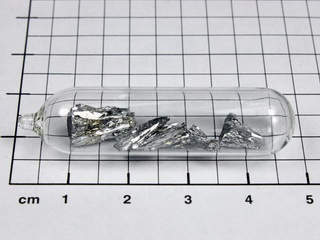 Tellurium is a rare, silvery-white, semi-metallic element which exhibits both metallic and non-metallic traits and has an abundance of 0.005 ppm in the earth's crust. It exists in only one form, whereas the other members of the oxygen group of elements in the periodic table all exhibit at least two allotropic forms. 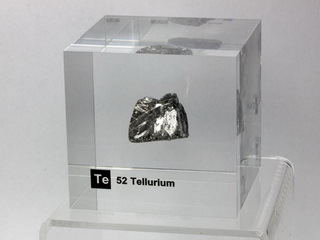 It is generally found in combination with other elements, and can be isolated from the fine dusts of telluride gold ores. 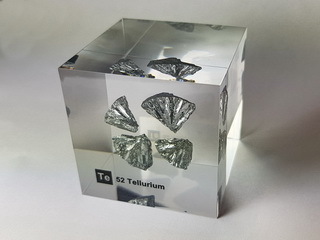 Tellurium will burn in air and oxygen, is unaffected by water or HCl, but is soluble in HNO3. 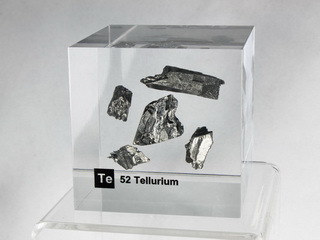 Tellurium has p-type semiconductor properties and, hence, is used in the electronics industry. 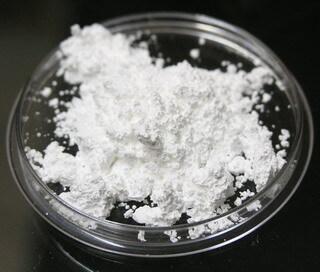 The metal is used in the refining of zinc where it eliminates cobalt from the process. Other metallurgical applications include its use as an alloying element with, for example copper and stainless steel, the resulting alloys having improved machineability. Contact with either the pure metal or its compounds is to be avoided as they are not only toxic, but inhalation of the vapours leads to unpleasant body odours!